This PDF 1.4 document has been generated by Mozilla/5.0 (Windows NT 6.1; WOW64) AppleWebKit/537.36 (KHTML, like Gecko) Chrome/55.0.2883.87 Safari/537.36 / Skia/PDF m55, and has been sent on pdf-archive.com on 31/01/2017 at 16:21, from IP address 96.82.x.x. The current document download page has been viewed 234 times. File size: 294 KB (13 pages). pharmacies are governed by individual state laws. entities was clarified in the Drug Quality Security Act of 2013 (DQSA) and explains the explosion of enforcement action in this area beginning in FY2014. 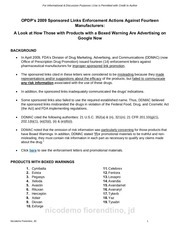 for sites that manufacture drug product. of an official mutual recognition agreement (MRA) between the regulatory authorities. (and second­most over the four years). Table 4 shows the number of warning letters issued both inside and outside the U.S. that included references to data management and data integrity. essentially the same as for warning letters issued outside the U.S., though the absolute numbers differ. FY2016, Figure 6 compares the intervals between inspection and warning letters and inspection and imposition of an import alert. past three years. FDA issued more than twice the number of drug GMP warning letters in FY2016 than it did in FY2015. area — expect continued focus here. FDA has refined its stated requirements for remediation of data integrity deficiencies. continuous improvement in GMP programs and practices and to minimize surprises during FDA inspections. Intelligence sub­group from 2010 to 2014. Barbara is currently the co­lead of the Rx­360 Data Integrity Working Group. This file has been shared by a user of PDF Archive. Document ID: 00546604.